Air Raid Precautions | The Dacorum Heritage Trust Ltd.
DACHT : 62.12.3. 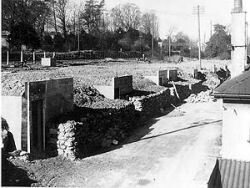 Building air raid shelters between the John Dickinson Guildhouse and railway. Early warning look-out posts signalled the imminent arrival of enemy bomber aircraft. As soon as a warning was received, an air raid siren was sounded. This emitted a loud and distinctive sound that could be heard for several miles. As soon as they heard it, everybody in the local area was expected to make their way, as quickly as possible, to their nearest air raid shelter. The best shelters were secure, underground bunkers (Londoners used the Underground railway stations), but many towns and villages had simple brick-built structures that offered only basic protection. These were generally built in blocks to serve an entire local area and, where possible, were surrounded by banks of earth to deflect the blast. These simple shelters were not expected to survive a direct hit by a heavy bomb, but offered a good degree of protection. DACHT : 62.18a.12. An air raid siren. These could be heard over a wide local area and gave early warning of an imminent air raid. After the war, many of these structures continued to be used as storage areas, temporary workshops, or even meeting places for local groups.